One of Scotland’s rarest carnivores is showing signs of recovery after years of declining populations, a new report has suggested. Scotland has renewed its call for landowners and their staff in some parts of Scotland to do more to protect raptors from being killed illegally. Director Stuart Housden said “intolerance” had been shown to the birds in parts of the eastern and central Highlands and southern uplands. The Scottish Gamekeepers Association said illegal killing was not tolerated. The SGA added that landowners and employees had worked hard to reduce incidents of bird of prey abuse. In the RSPB‘s newly-published report, The illegal killing of birds of prey in Scotland in 2011, Mr Housden praised land managers’ efforts to conserve species of birds such as lapwing and capercaillie. But he said birds of prey continued to be persecuted. Fewer raptors were found poisoned in Scotland in 2011 than recorded in the previous year’s RSPB report. 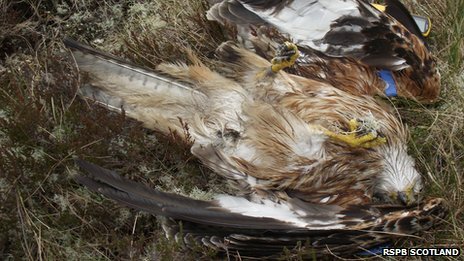 Tests confirmed 20 raptors, including a golden eagle, seven buzzards and four red kites, were poisoned in 2011. In 2010, 29 birds were found killed in this way according to the RSPB. But Mr Housden said potentially more birds were killed but not found. He said 2011’s toll still made for “depressing reading”. As well as the poisonings, there were 16 incidents where birds were killed illegally by other means. Buzzards were found dead in crow traps in Perthshire, a peregrine was shot near Ballater and a short-eared owl was shot in Strathdon, both in Aberdeenshire. A goshawk nest near Peebles in the Borders was also recorded to have been shot at. In the report, Mr Housden said many landowners and their employees acted responsibly and helped in efforts to conserve species such as lapwing, corncrakes and capercaillie. “The fact that the illegal killing of birds of prey in Scotland has continued is inescapable. SGA chairman Alex Hogg said the figures in the RSPB report were similar to Science and Advice for Scottish Agriculture statistics, that were published in March and September this year. He said 2011 had seen an increased number of investigations that had found fewer cases of abuse, but had instead uncovered deaths caused by birds colliding with power lines and vehicles. “This is at a time when raptor numbers are, in many cases, the highest ever recorded and more and more people are losing increasing number of livestock to birds of prey, putting jobs and families at risk in a difficult time for the Scottish economy. An osprey chick being snatched from its nest by a buzzard has been captured in dramatic video footage. The clipshows the chick’s mother flying away from the nest and a buzzard swooping in. Rural businessowner Euan Webster saw the chick being taken by the buzzard at his property Lochter in Aberdeenshire. The chick was one of two that had hatched at the nest. The half eaten carcass of the osprey chick was recovered near the nest earlier this week and it was confirmed on Wednesday that it is to be handed over to SASA (Science & Advice for Scottish Agriculture, the ScottishGovernment laboratories) for proper analysis. Mr Webster has 24/7 video surveillance on the nest for both wildlife watching for the enjoyment of the public in addition to protecting the rare ospreys. He said: “This was a shocking act and clearly demonstrates why something needs to be done to control buzzards. It cannot be right that the buzzard remains protected yet they swarm over the countryside in large numbers eating prey, including iconic and beautiful birds such as ospreys, at will. “Any farmer or shepherd will tell you about the threat from buzzards yet the powers that be are reluctant to face up to the fact that sooner rather than later measures have to put in place to control them. This incident should sound alarm bells among those who care about the conservation of our rarer wild birds such as ospreys in Scotland. “As a former chairman of the Game & Wildlife Conservation Trust’s Grampian regional group I am an enthusiastic believer in balanced and managed conservation. I know research by the trust is suggesting buzzards are active predators that may well be affecting conservation of birds in some parts of Scotland. Buzzard numbers have been growing steadily since the 1980s and numbers in Scotland are now at record levels. Douglas McAdam, chief executive of Scottish Land and Estates, said: “While previous reports of such predation have been brushed off by those who do not like the reality of what is happening in the countryside, this video provides the sad but clear and conclusive evidence of the serious impact that this growing population of buzzards is now having. The clip shows the chick’s mother flying away from the nest and a buzzard swooping in. Rural business owner Euan Webster saw the chick being taken by the buzzard at his property Lochter in Aberdeenshire. The chick was one of two that had hatched at the nest. The half eaten carcass of the osprey chick was recovered near the nest earlier this week and it was confirmed on Wednesday that it is to be handed over to SASA (Science & Advice for Scottish Agriculture, the Scottish Government laboratories) for proper analysis. Buzzards numbers have been growing steadily since the 1980s and numbers in Scotland are now at record levels. WILDLIFE NEWS and ART Create a free website or blog at WordPress.com.